The goddess of love, beauty, and desire, Aphrodite was also mistress of the seductive arts, perfume primary among them. Accustomed as we are to the aromas of car exhaust and air-conditioned buildings, to us the ancient world would perhaps be most overpowering in terms of smell. Sweating men and animals and their waste filled a city’s streets, making it vital to set off sacred spaces as well as those of luxury by making them smell sweet. Fragrance was everywhere in the ancient world, from scented oils used to adorn the body to incense burnt in homes and temples. 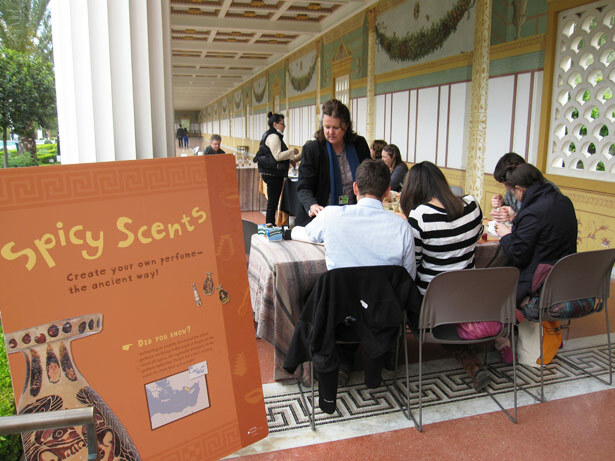 A visitor checks the scent of labdanum, a favorite base note for ancient perfumes. Perfumes had many uses and meanings: they could be holy, used in the worship of the gods or the burial of the dead; they could be a symbol of status and superiority, used by athletes, aristocrats, politicians, and royalty; they could be medicinal, used to relieve ailments of the lungs or skin. In ancient Egypt, Greece, and across the Roman Empire, perfume was part of ritual, beauty, and commerce—much as it is today. I wanted to mimic as closely as possible the way perfumes would have been made in the ancient world, so I had to find out how that worked. Written sources describing ancient perfuming making are vague at best, though some writers such as Theophrastus (Greek, c. 270–285 B.C.) in his book On Odors and Pliny the Elder (Roman, A.D. 23–79) in his Natural History include lists of ingredients for perfumes, as well as some discussion of techniques and tools. Tablets from Knossos, Crete, document oil deliveries to be processed by perfumers, and tablets from Mycenae, Thebes, and Pylos mention the work of perfumers. Visual sources of information were a little more helpful—the ancient Egyptians depicted perfume making, and humorous Roman frescoes from Pompeii and Herculaneum showing bands of cupids in perfume shops mixing scents are known. One of these is on view at the Villa in Gallery 207, Women in Antiquity, where we also have many exquisite perfume containers—an industry in itself in the ancient world. 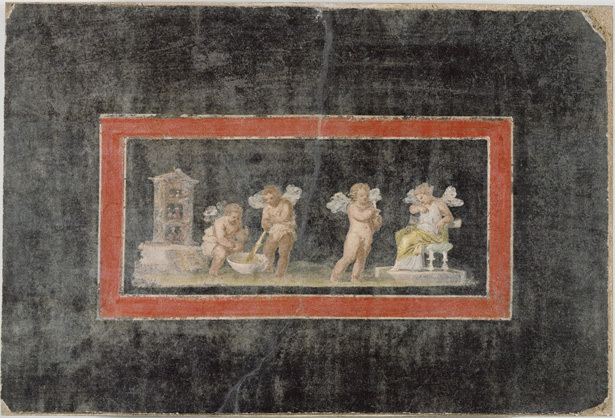 Wall Fragment with Cupids and Psyche Making Perfume, Roman, A.D. 75–100. Plaster and pigment, 14 15/16 x 22 1/16 in. My first discovery was that in the ancient world oils were used as the carrier medium for perfumes. 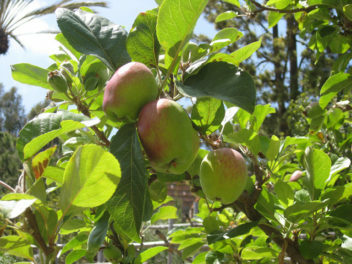 In modern perfume making, an alcohol is usually the carrier medium, with essential oils added for fragrance combined with fixatives, coloring agents and preservatives. Alcohols evaporate much more quickly than oils do, thus dispersing scent into the air more rapidly. An ancient perfume would therefore be more subtle, and you’d have to be closer to the skin of the wearer to feel its heady power. 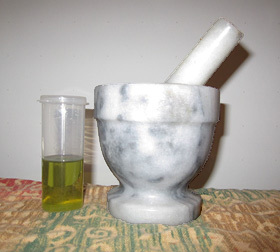 To start the creation of your own perfume, you’ll need some olive oil and a mortar and pestle. In the age of Greece and Rome, the abundance of olive oil made it the most popular oil for the perfume industry, though other oils such as almond were popular as well. Cheaper oil was better (and still is) because it has less of its own scent to compete with the fragrant materials. To impart fragrance, plant-based ingredients were used, including flowers, leaves, seeds, woods, resins and gums. Animal-derived ingredients were also common, such as musk and civet, which are the glandular oils produced by the musk deer and the civet cat, as well as ambergris, a strange substance secreted and occasionally expelled by sperm whales. These aromas tend to be pungent and even unpleasant in their natural states, but act as fixatives in combination with other scents, accentuating them and making them last longer without imparting their own scents to the mixture. As in ancient times, today more expensive perfumes still use mostly natural products—essential oils gathered from flowers, spices, and fruits, while cheaper ones are made from synthesized oils that approximate these natural scents. A perfume is made by layering scents according to how volatile they are, that is, how easily they evaporate. Top notes evaporate quickly—they are the first scent you smell in a perfume. Middle or heart notes form the main body of a perfume. Base notes are fixatives—they hold and blend the other ingredients, and they stay on the skin the longest, so you always smell them in combination with the other aromas of the perfume. Animal-derived scents were the most precious base notes of the ancient world, as they still are today. 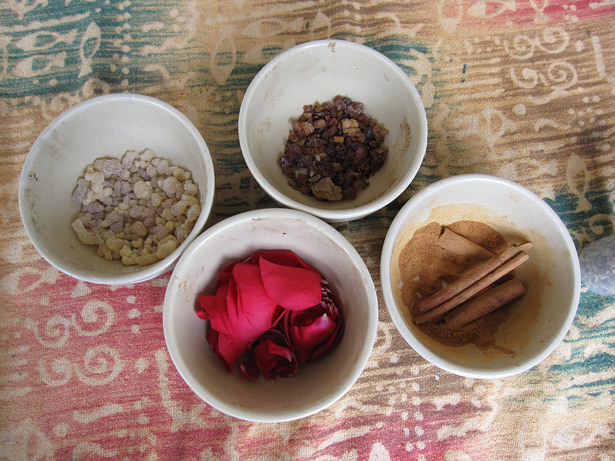 Natural musk is almost impossible to come by now, and civet and ambergris are likewise fairly rare, so I had to settle for more common, but no less authentic base notes for our perfume-making activity: frankincense, myrrh, and labdanum. All are resins, or plant sap. Frankincense and myrrh can be purchased in their raw form of small nuggets, which you can grind and add to the olive oil into which they melt to lend their scent. 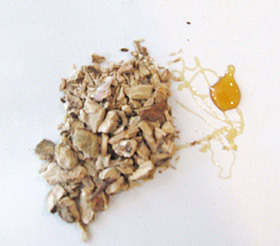 Labdanum is a viscous, sticky tarlike substance in its resin form. You can also purchase the essential oils of any or all of these substances. Labdanum resin, rumored to be a main ingredient in Julius Caesar’s favorite cologne. 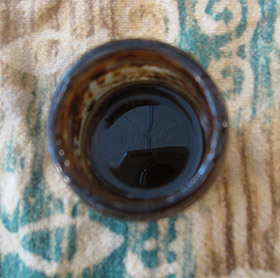 Even as an essential oil, labdanum is thick, black, and sticky. To make your own perfume, only use one of the three though, and only a little of one at that—4 to 5 nuggets or 2 to 3 drops of the essential oils in 2 ounces of olive oil. These scents are strong and can overpower your final perfume. For a man’s cologne, you might choose two, or a little more of one. For middle notes we used some scents that are still well-known in modern perfumery: rose, cinnamon, benzoin (more commonly known as styrax in the ancient world) and calamus (called by many names by ancient writers, including sweet flag or sweet rush). Rose and cinnamon were a favorite combination for the heart of a perfume. Rose petals can be added directly to the olive oil mixture; no more than 1 to 3 petals though, or the rose will overwhelm your final mixture. Cinnamon can be added by breaking up the sticks into small pieces, or even by shaking ground cinnamon into your oil. This combination makes a sweetly spicy scent, altered this way or that by the base note—atop frankincense’s piney smell it is more spicy, atop myrrh’s gentle warmth the rose can shine, and atop labdanum’s pungency, the cinnamon really pops. Sweet rush and styrax. Styrax, also known as benzoin, is still a major ingredient in perfumes. My personal favorite is styrax, a deep, vanilla-y scent that is, like the base notes, a tree resin. It also can be purchased in its raw form, though it’s expensive that way. The essential oil is a honey-like liquid that can be added to the olive oil using a coffee stirrer to gather and then drip it into your perfume. I also love sweet rush. The root of the calamus plant, which can be ground and added, sweet rush has a strong, light, sweet smell, like gold for the nose. At the perfume-making workshop, our top notes were spices you’ll recognize from your own kitchen: anise, the seed that gives licorice its distinctive scent; marjoram, the cousin of oregano that the ancient Greeks associated with joyous occasions like weddings; and coriander, the seed of cilantro. We advised visitors to use liberal amounts of these lighter scents so they would not get lost under the power of the heartier middle and base notes. Anise and coriander need to be lightly ground, while marjoram leaves can be added straight to your olive oil. A favorite recipe of many was myrrh, rose, styrax, and marjoram for a warm, sweet perfume. Those who liked spicier scents might mix frankincense with cinnamon and a little sweet rush, then top it off with anise and coriander. Brave souls experimented with combinations of sweet and spicy, layering labdanum under styrax and cinnamon, topped with marjoram. To complete your perfume, heat your oil mixture by pouring the oil and other materials into a glass or ceramic dish, heating water in a pot to boiling, turning the heat off and sitting the dish with the oil into the water as it cools. 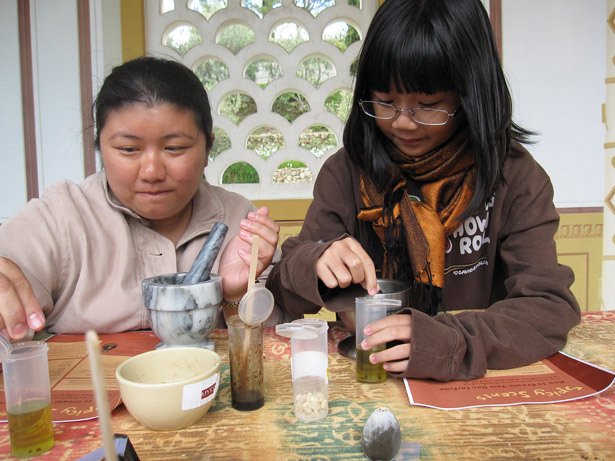 This process draws the essential oils from the materials and can be repeated more than once. The mixture should then steep for at least 24 hours, at which point it can be strained—cheesecloth lets you wring the oil out while keeping all bits of ground materials out of the final mixture. 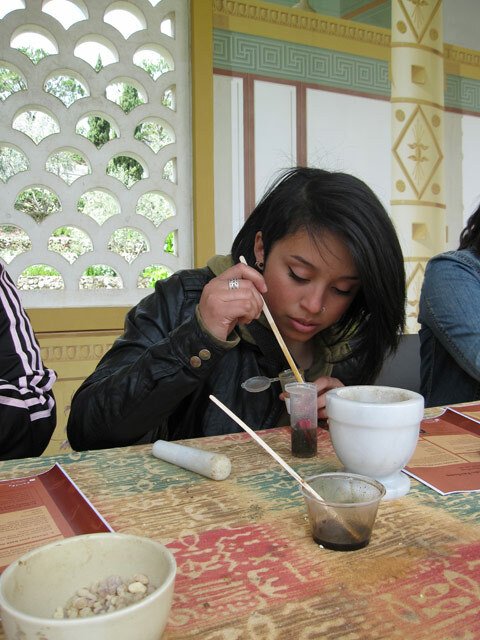 I’d love to hear from our visitors who did the activity with us at the Villa. How did your final perfumes turn out? 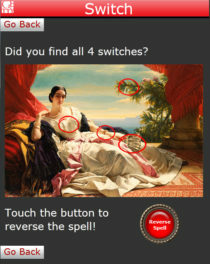 Or if you try this at home, let us know what the results are. Were they what you expected? May Aphrodite sweeten your skin with fragrant oils so that you taste a little of her power! I cannot wait to try this. I am allergic to current colognes and yet my body chemistry carries cologne scents very well. I am also fascinated with the scents of antiquity especially after reading the “Extra Virginity” book about olive oil. You have done all my homework for me. This is incredibly useful! Thank you… I’m reading “Inside the Rennaissance House” by Elizabeth Currie. She mentions that Rennaissance Italians did not usually bathe with water. Instead they put perfume on their skin and wiped it off with linen towels. This sounds to me like an evolution of the Roman custom of scraping oil off with a strigil. A nice way to get clean in cold weather or if you’re in a hurry or camping. I assume that the “perfume” they used for this was a lightly scented oil. Modern people could use a scented lotion or one of these recipes! This is sooo Awesome! I was looking for an all-natural Frank & Myrrh oil without any phthalates, parabens, hormone-disrupting chemicals, and known chemical skin sensitizers. Couldn’t find anyone that sold it like that. I have pounds and pounds of both resin though. Time to craft my own! Thanks a bunch for your research & creativity!! How do you store this? And when does it go rancid? How long will it stay fresh for? it would depend on what oil you use and what temperature you store it at and how much light and air it is exposed to. rancidity is caused by oxygen bonding with the fat molecules and fatty acids that make up the oil/fats which can break down over time. try choosing one that is as stable as possible. olive oil is notorious for going rancid fairly quickly. coconut oil is better although thicker but very moisturizing for the skin as is almond oil. try keeping the end product in the refrigerator where it is cool and dark to keep it longest in the smallest air tight container you can fit it in and or in a dark glass bottle like cobalt or brown. grape seed oil is also ok. and try to check the container for pressing dates to ensure the freshest product. keep in mind just because the bottle hasn’t been opened doesn’t mean it cant be oxidized. ultraviolet rays from light encourage the air trapped int he bottle to combine with the aging oil in the bottle. so if it has been sitting in the store for 6 months, thats 6 months you wont get out of your oil. hope this helps. Hi Connie – I have a bottle I made well over a year ago, stored simply on my desk (no refrigeration) which is still good, so it lasts a nice long while! Hi Joe – I haven’t worked with any alcohols since the ancients used only oils. I also haven’t had the chance to work with any civet extract, but my understanding is that it is extremely strong and should be used sparingly. A drop or two in up to a 6 oz amount of oil would probably be plenty. But the only real way to know is to try different combinations of that bottoom note with a variety of mid and top notes and see what creates the scent you like. Joe, i think they have to kill the civet to get the musk oil. a bit of a buzz kill for the lovely perfume you will be making! Years ago there was an exhibit on ancient perfumery at the Michael C. Carlos museum at Emory University (called “our fragrant past” or something) that featured an excellent book on the subject, and sample vials of perfumes of ancient times. 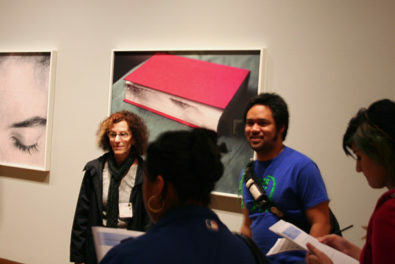 The exhibition book can probably still be found online, though who knows about the sample vials. Looking to do a perfume (even have a glass oil stem bottle from my Mom) with a base of frankincense and myrrh (one tear each), mid note or ginger and orange, and top of lavender blossom and mint leaves. How orange peel and ginger root would you recommend? I planned a tbsp of culinary lavender and 2-3 smallish mint leaves. I would like to make my own perfume. Where can i get the ingredients in South Africa?